Today you are transferred to Kolkata Airport to board flight for Guwahati. On arrival at the Guwahati airport, we are met at the receiving area and with packed lunch drive through the busy streets to the ‘Kamakhya Temple’ (flight times permitting). This Temple is devoted to the eternal feminine, the goddess of desire whose name is Kama Khya, granter of desires. The Kamakhya Temple in Assam symbolizes the “fusion of faiths and practices” of Aryan and non-Aryan elements in Assam. Animal sacrifices take place here almost every day. Walking up to the temple complex, we will see many colorful idols of gods and goddesses in the local market shops. From here, drive to ‘Pandu Port’ to board MV Mahabaahu and enjoy a ceremonial Assamese welcome. We gather for introductions, safety briefing and are ushered to the cabins. All gather on the open deck to enjoy the first sail and scan the river for a fleeting sight of the Gangetic Dolphins. After breakfast, we gather to understand ‘Assam, its geographical location and importance’. M.V. Mahabaahu heads on for a full day sail dotted with an interesting village visit as we pass by inhabited and deserted islands. 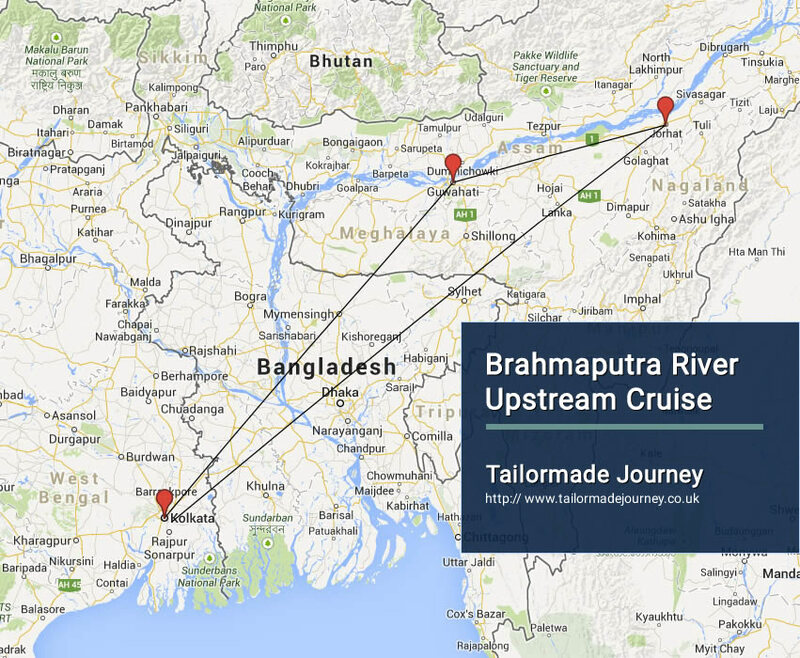 Post tea, we proceed for another interesting talk on ‘The River Brahmaputra and the tribal life that exists alongside’ and then step out where the ship anchors for the evening. Start the day with Yog as MV Mahabaahu sails towards Silghat. We pass by the famous town of Tezpur and under the famous 3 Kilometres 15 meters long arched bridge called Kolia Bhomora Setu. After breakfast, indulge in a talk on ‘Kaziranga and wild life in India’. We sail on for the next couple of hours and enjoy a relaxed lunch. After lunch we sit through a talk on ‘Tea and jute in Assam’. We arrive Silghat and MV Mahabaahu drops anchor. Take a short drive to a tea estate and enjoy a nature walk to this verdant undulating tea garden that straddles on the bank of the river Brahmaputra. Witness the ‘bagania’ women plucking the tea leaves. We proceed to the tea factory (operational from mid March to mid December) to see the process of finally producing Assam Tea and coming to terms with ‘all that goes into preparing a cup of tea’. We visit the Jute mill from mid December to mid March. The Jute mill is the bread and butter of 600 local workers and runs in three shifts; one can see the complete process of producing gunny bags from the Jute fibre. By sunset, we are ready to drive back to the MV Mahabaahu to enjoy a cultural evening followed by dinner and then to retire early for the next morning’s elephant safari. Rise very early and after tea/coffee, depart before sunrise for the Kaziranga National Park. The most prized inhabitant of Kaziranga is the Greater One-Horned Indian Rhinoceros, but the Park is home to as many as 180 different mammals including wild elephants, tiger, deer, Asiatic wild buffalo and a rich variety of birds. We reach the Kohora Mihimukh and start our morning adventure; once-in-a-lifetime elephant-backed safari where we search for the elusive rhinoceros, tigers, swamp deer, hog deer and more. After breakfast at a resort in Kaziranga, drive on to Bagori, the Western Range of Kaziranga and get into open jeeps to hunt for more wildlife. We enjoy a cup of tea and enjoy a talk on ‘Silk in Assam’ and a short orientation on Bishwanath Ghat. We take the tenders to visit this charming village. Visit the Shiva temple in reverence of Lord Shiva and there is no way that we can escape the women with their weaves and enjoy an excellent bargaining hour for the home-spun weaves. (We carry cash to the village to buy silk and cotton weaves by the villagers to encourage local craft). Walk through the streets near this Ghat and move towards a quaint little rocky inlet of the Brahmaputra. Return to MV Mahabaahu and get ready to spend the evening in the Soma Lounge followed by dinner. We can then choose to watch a documentary or retire for the evening. Early morning Yog is on the charts as MV Mahabaahu sails on. Breakfast is followed by an orientation of the ‘Boat Safari’ and the ‘Mishing Village’. We enjoy a morning boat safari at the Dhansiri confluence. The presence of hovering pied kingfishers is an indication of fish life & the fallen branches of trees into the river support roof turtles. Endangered vultures and eagles too can be spotted. Several migratory birds depending on the time of the year feature themselves in this area. Whatever we see is a bonus to all that we’ve seen at the Park—wild life is always a gamble and weather (fog/mist/wind/rain) plays a major role. (In the month of October and May we enjoy a boat safari at the confluence of Diphlu and Brahmaputra river in the morning and at Dhansiri in the afternoon) We enjoy lunch while MV Mahabaahu sails towards the Mishing village. Arrive at a ‘Mishing’ village and disembark on buoyancy boats to reach the village banks. The ‘Mishing’ are an ethnic group inhabiting a number of districts in Assam. Generally the Mishing live on the banks of a river. They live in ‘Chang ghars’, a house with raised platform. Almost all Mishing women are expert weavers. After climbing up to the house platform and exploring Mishing homes, purchasing some of the colourful weaves, fresh vegetables and more, return to the comfort of the MV Mahabaahu for lunch and sail on. We gather our experience of the evening and return to MV Mahabaahu where the Chef awaits our return to involve us in his cooking demonstration. This evening, enjoy a relaxed quiet walk on a deserted island and lay back in the cosy set up of the deserted island. Yog as usual and breakfast followed by a talk on ‘Majuli and Vaishnavism’ as we sail towards Majuli. Majuli which literally means land between two rivers is a cosmos of Assamese culture where various philosophies co-exist and thrive; ancient monasteries dedicated to preservation and development of culture and art have existed here since the 15th Century. Late afternoon after we’ve had lunch and rested we drop anchor and drive to ‘Kamlabari Satra’ to witness a performance by the Vaishnavite priests in the temple premise. Walk through the humble dwellings of the monks and talk about their daily chores and this is an insight into their chosen path. Next the drive takes us to a scenic corner of ‘Garamur Satra’ for an interesting cultural performance by Satriya singers and dancers. We also witness the mask dance that exhibit folklore and are steeped in mythology. This evening we sail back to another unexplored island and Assamese is the theme of the evening. We enjoy a light snacks at the island followed by dinner onboard. Start the day with Yog and enjoy breakfast as we sail towards Neamati Ghat followed by a talk and orientation on ‘Sibsagar and the Ahom civilization’together with an orientation on the ‘Tea-estate visit’. We disembark and drive on to a Tea Estate for a relaxed morning with the Tea-estate family to get a peep into the lifestyle of the families that have been involved in the tea business for generations. We enjoy a tea-talk and tea-tasting at the estate. After an Assamese lunch, we drive to Sibsagar, the ancient city of the Ahom Kings; a town that literally means ‘the ocean of Lord Shiva’. The district is strewn with the tell-tale ruins of a powerful empire of the Ahoms. Sibsagar was the capital of the Tai-speaking Ahoms who came to the area from Yunan and China in the 13th Century AD. Visit the Talatal or Karen Ghar which was the palace of the Ahom Kings and after a leisurely stroll in and around the monument we go on to Rang Ghar which was a place for entertainment for the Royals and their guests. Proceed to the Sibsagar town where on its banks are located some of the famous temples of Sibsagar. The Shiva Dol, constructed in the year 1734 is believed to be the highest Shiva temple in India. We return to MV Mahabaahu for our farewell dinner where we again raise a traditional toast to the journey completed. Yog/ bird-watching for those who manage to find time or perhaps an early morning indulgence in the spa or a hair-do. We drive with packed lunch to the Rowriah Airport in Jorhat to board flight for Kolkata.